I am lucky enough to have storage room in the basement of my library to store flannel stories and puppets. I organize my flannels in two ways: one in milk crates and cardboard boxes, and one in Excel. All the stories are in alphabetical order. I have the 1) Title of the Book, 2) # of Flannel Pieces (to make sure I enough to share), and 3) Themes. 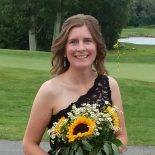 I am consistent with my themes so I can search using keywords. For instance, “Dog’s Colorful Day” themes would include: colors, counting, numbers, bedtime, dogs, bathtime. 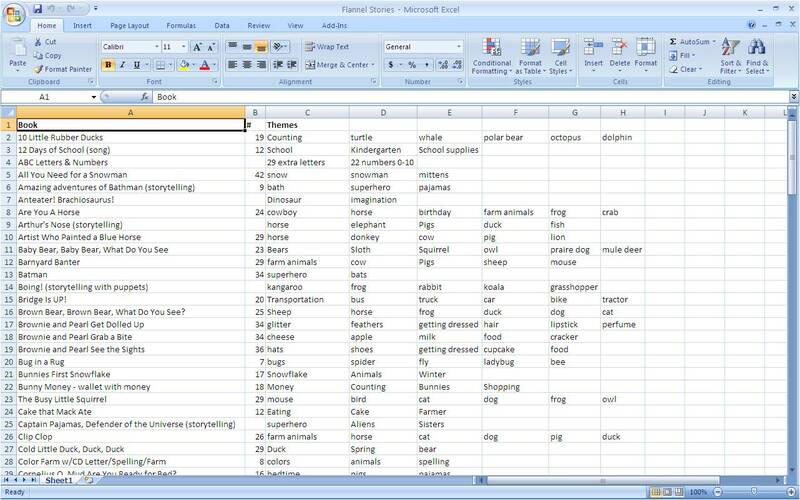 When I am planning and prepping my future programs, I am able to search keywords in Excel with a document I created. 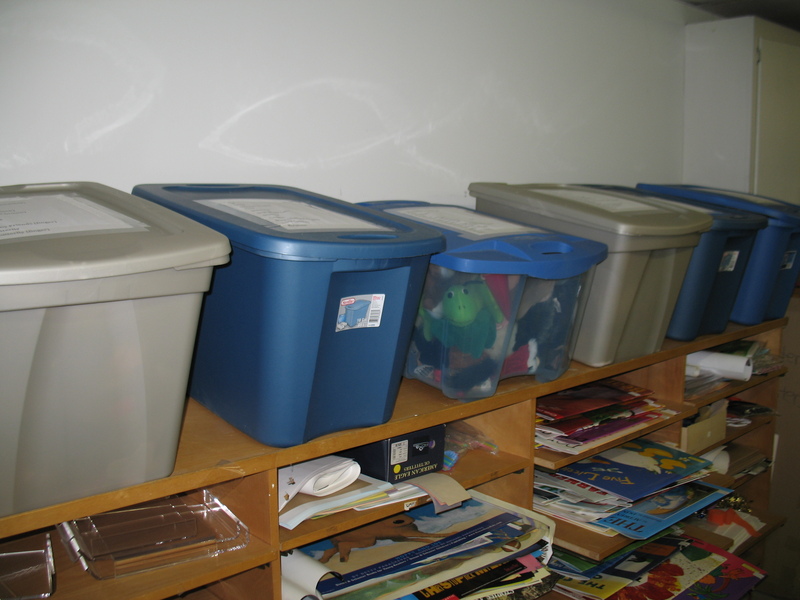 My puppets are also alphabetically organized in tupperware bins (to keep them safe from dust and insects). 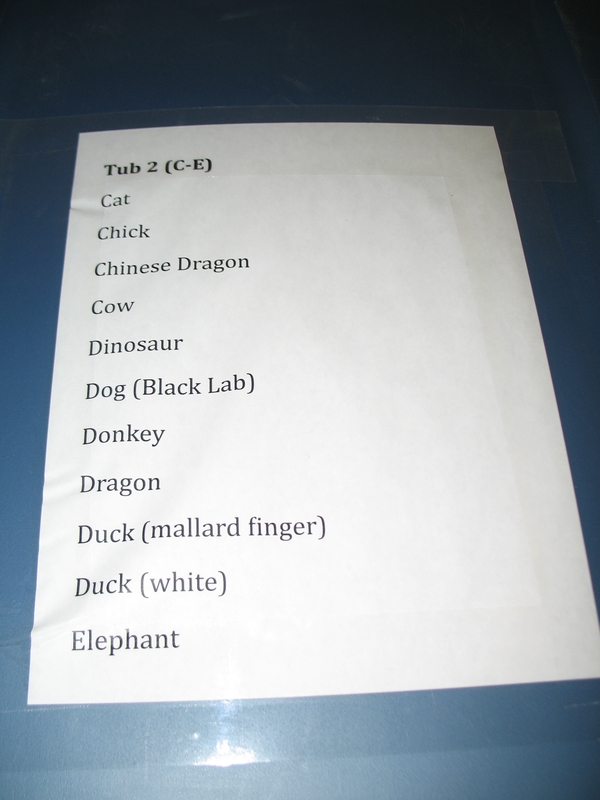 Each tub has a list of the puppets that live in it. My Excel sheet matches the puppet bins so I can easily find what I’m looking for. I’ve recently developed my Finger Puppet collection. 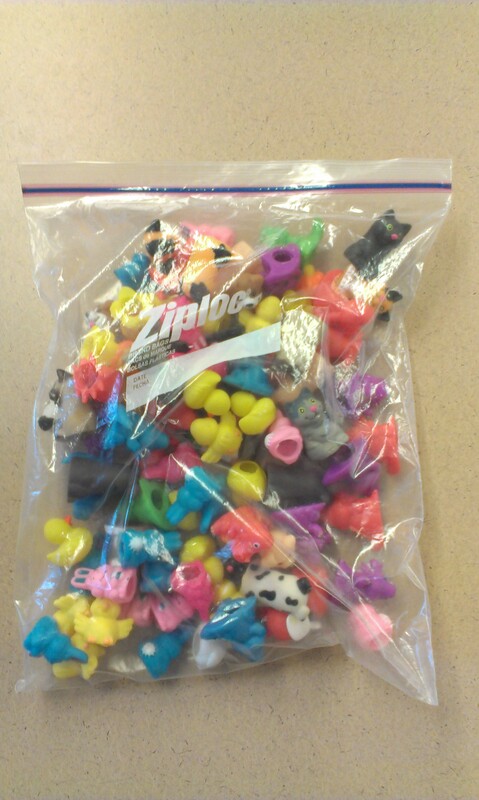 I have them stored in several gallon-size Ziplock bags in no particular order. 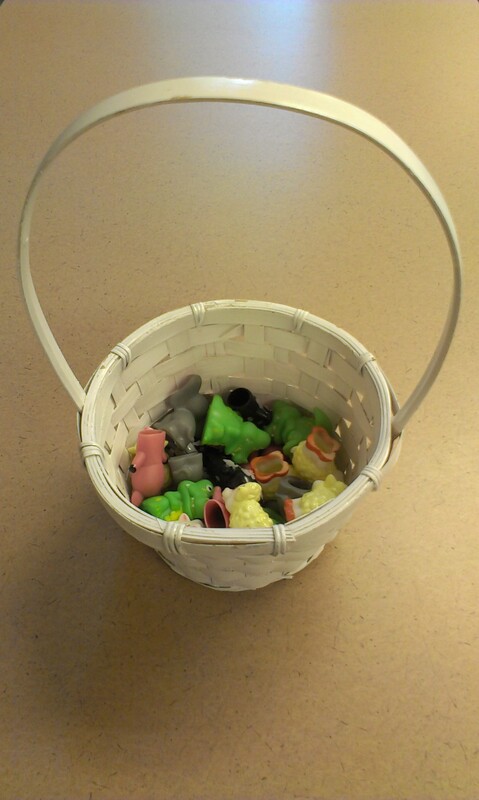 I choose a song I want to use for a storytime session, and place them in a small basket to handout and collect during the program. 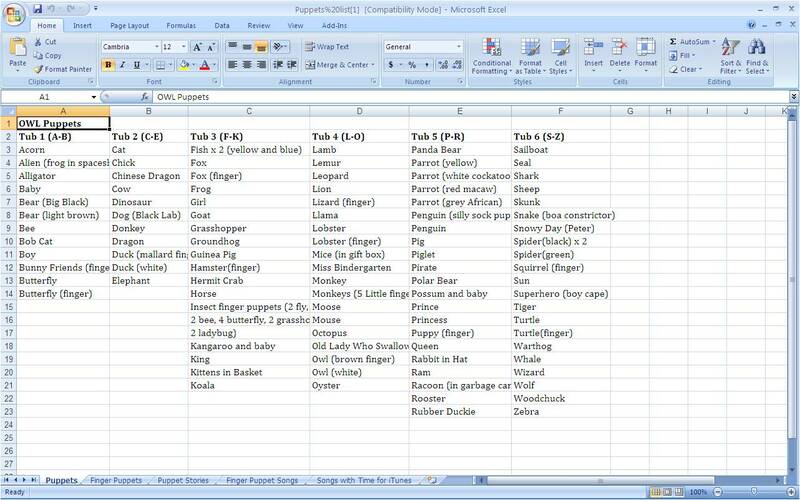 I developed an Excel sheet so I can pair up the correct song and puppets together. This list features 1)Song Title 2) Artist 3) Album 4-10) the Puppets in Order of Appearance. 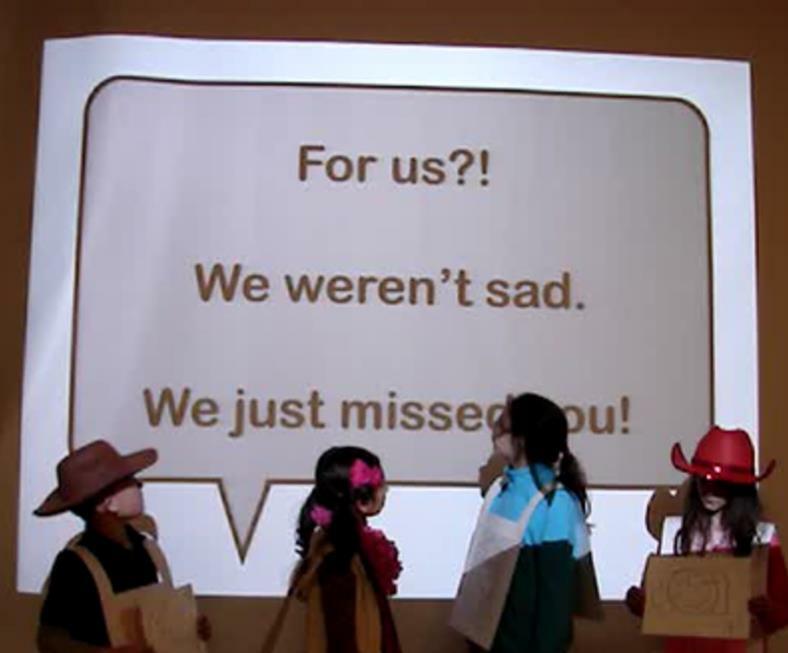 For more flannel and storytime ideas, check out Future Librarian Superhero’s blog. She hosting Flannel Friday this week. Fantastic post! I am finally organizing my flannels. I am taking pictures of all my flannels and posting them on Photo Bucket. Then I tag each on with a tag…. i.e. colors, sheep, farms, counting etc. And I also tag them with the folder they will be located so I can find the one I’m looking for. If I tag each item in each flannel, I can pull a horse from one and make a flannel story without having to craft another horse. Oh, that’s a great idea! Thanks. This entry was posted on July 26, 2013 by mrsshaia in Organization and tagged Organization.